nRF905 is a single chip radio transceiver for the 433 / 868 / 915MHz ISM band. The transceiver consists of a fully integrated frequency synthesizer, receiver chain with demodulator, a power amplifier, a crystal oscillator and, a modulator. The ShockBurst™ feature automatically handles preamble and CRC. You can easily configure the nRF905 through the SPI. Current consumption is very low, in transmit only 9mA at an output power of -10dBm, and in receive mode 12.5mA. Built-in power down modes makes power saving easily realizable. Tri-band transceiver unity, the operating frequency for the international general ISM band the 433 / 868 / 915MHz GMSK modulation, anti-interference ability, particularly suitable for industrial control occasions DSS + PLL frequency synthesizer technology, high sensitivity and excellent frequency stability achieved -100dBm low operating voltage (2.7V), low power consumption, standby only 1uA maximum transmit power of +10 dBm to meet the requirements of low-power devices with multiple channels (up to 170), especially to meet the needs of multi-channel work. Maximum operating rate up to 76.8Kbps. Minimum of external components (only 10), and the basic need to debug. As a result of the low transmit power, receiver sensitivity design, there is no need to apply a permit for usage. In open areas and ideal environment conditions, nRF905 can transmit at distances up to 1000 meters ** related to the specific use of the environment and the device parameters. Fully compatible (PTR8000 +) module. 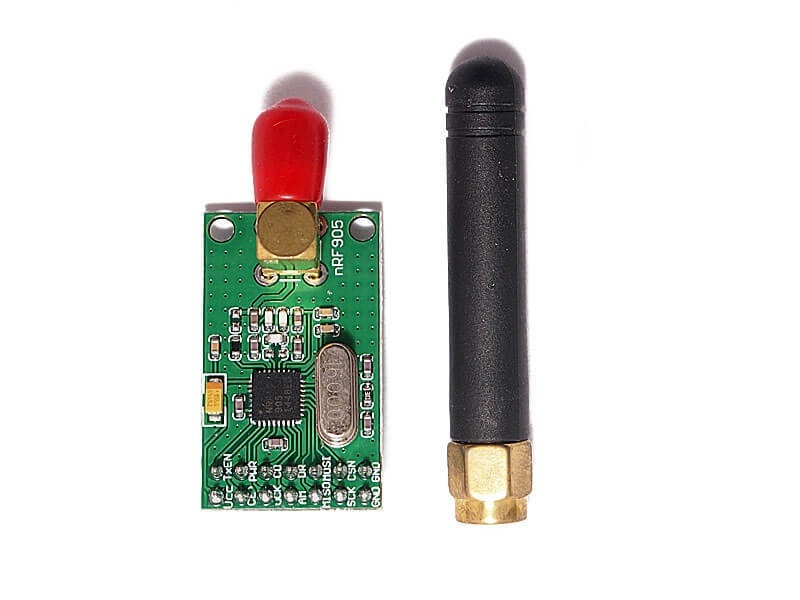 This wireless transceiver module operates on 3.3V logic.